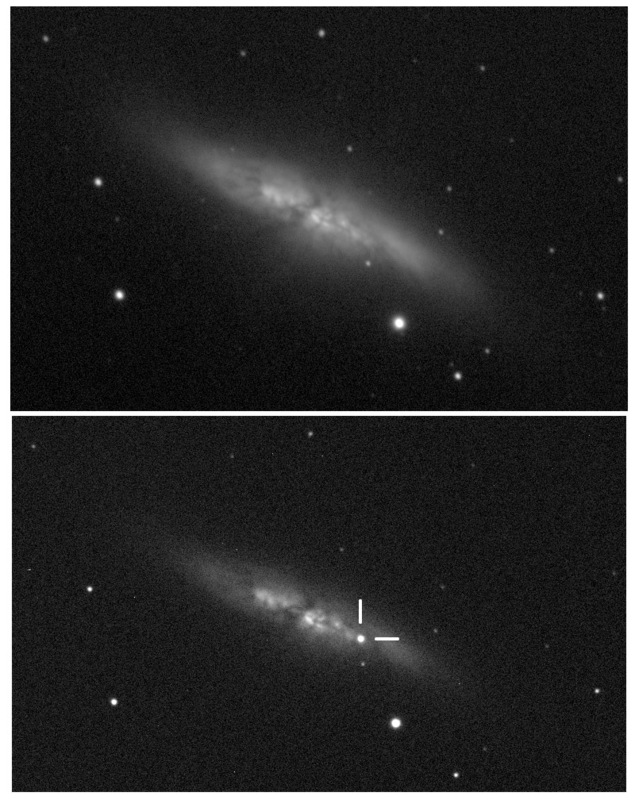 Students and staff of the University of London Observatory detected on 21 January a supernova that had remained undetected during about a week (http://www.ucl.ac.uk/maps-faculty/maps-news-publication/maps1405). The supernova was confirmed by other astronomers at observatories as a type Ia supernova caused by a white dwarf star pulling matter off a larger neighbouring star until it becomes unstable and explodes. It is now officially listed by the International Astronomical Union as Supernova 2014J (http://www.cbat.eps.harvard.edu/lists/RecentSupernovae.html). The supernova is located in M82, the “Cigar Galaxy”, and is expected to increase in brightness during the next days (actually mag 11). This is the nearest supernova since Supernova 1987A in the Large Magellanic Cloud. This entry was posted in Supernovae and tagged supernova by Martin. Bookmark the permalink.